Coming to a Cinema Near You… in Prague! When Zuzi and I travel abroad, we always try to see a movie. It has become sort of a tradition of ours. Once we get to our destination, one of the first things we do is check out the programs of the local movie theaters if they show some movies with subtitles that we could understand. We usually go see movies made in the US, so we just want to make sure they are with subtitles, not dubbed (which can be a major problem in Germany, for instance. We encourage you to go see a movie in Prague. Czechs actually love movies and there are many great movie theaters in Prague, ranging from US-style multiplex cinemas to small art movie houses. Most importantly, all foreign movies are usually subtitled (with the logical exception of movies for children), and some popular Czech movies may have one or two copies out with English subtitles (like the hilarious "Sunday League" about the coach of a local village soccer club now in cinemas), which means that English-speaking moviegoers can enjoy a movie in Prague, too. If you want to see the latest Hollywood blockbuster (and by latest, I mean about three-month old compared to US release dates) and buy popcorn and coke to enjoy a movie, head over to CinemaCity movie theaters. Their Slovansky dum cinema is conveniently located in the centre, just a few steps from the Municipal House and the Powder Tower. The tickets cost about CZK 170 (USD 9, EUR 7). Other CinemaCity cinemas can be found in major shopping malls that are located near the subway stations (Flora, Andel etc.). If you want to watch a movie in a more intimate, artsy setting, you must watch a movie in many art house cinemas around Prague. They have a really low-key, relaxed atmosphere. You'll be joined mostly by Czech university students that simply adore the cinema. This is best witnessed at the Karlovy Vary International Film Festival, probably the only Class A film festival in the world (visited by the likes of De Niro, Keira Knightley, Morgan Freeman etc.) that has a tent village and mobile lavatories for the crowds of backpacking students that flood the festival in thousands each year. If you want to see a great movie but don't want to venture out of the centre, head over to the Svetozor cinema. This cinema offers a great selection of new and older movies in two screening halls. For a truly local experience, buy a glass of Kofola (Czech coke) for the movie at the bar. The Svetozor also includes a really great shop called Terry's Posters (Terryho ponozky in Czech), which sells vintage Czech and Polish posters for American and other movies that were shown in the Czech Republic and Poland under Communism and after its collapse (like the Reservoir Dogs poster in the gallery) - a perfect souvenir from Prague! Another great cinema can be found across the river in the Letná district of Prague 7 - the Bio Oko. This is one of the few old-school cinemas with a balcony remaining in Prague. It is seated in a 1930s Czech Bauhaus (functionalist) residential building and features a great bar in the entrance lobby, which can be very lively at nights (I used to live just above it, so I know, trust me). For another great functionalist building in the area, visit the enormous National Gallery just two blocks away or the National Technical Museum 10 minutes by walk from the Bio Oko that is a great destination if you're traveling with kids. 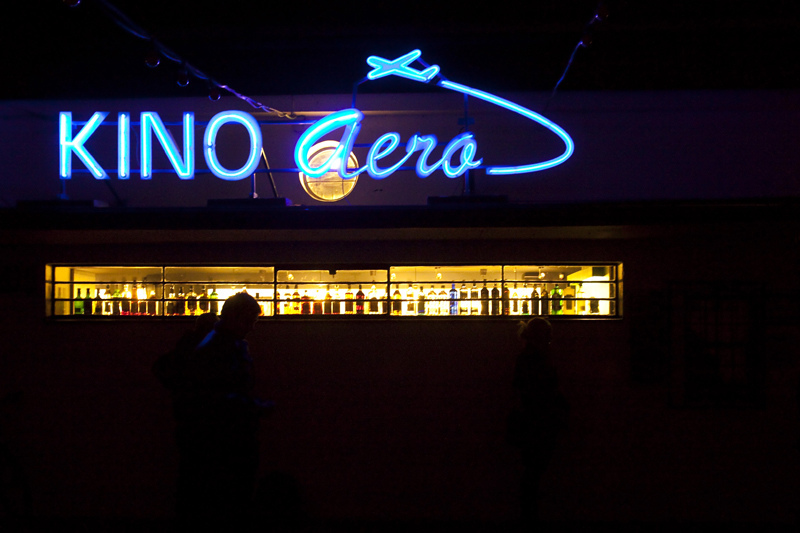 Last but not least, the Kino Aero is a bit further from the centre in the lively Zizkov centre, but definitely worth a visit (we recommend visiting the Vitkov National Memorial that is on the way). The Aero is one of the most popular independent art house movies with a great schedule that will appeal to all moviegoers. Visiting Aero, which really binds the local community at Zizkov together, will be a really local experience - you will probably be the only foreigners there, the crown will again be a bit younger. The tickets to all these smaller art house cinemas will cost around CZK 100 (USD 5, EUR 4). Older PostDo what the locals do and see the Slavia - Sparta derby!